I’ve always loved Argoz for their socks and I just so happen to own a few pairs. I look forward to wearing them every winter with my boots. Not only do they keep my little toes warm, but when I go to someone’s house and take my shoes off they say “Hey! Cute socks!” You can also wear Argoz socks in the summer with a cute pair of shorts and converse. They just work year round and they’re socks that last. So, when I received word that the San Francisco company had added more products to their line, I was very excited. The new items include handmade silk neckties, bow ties, pocket squares and infinity scarves. 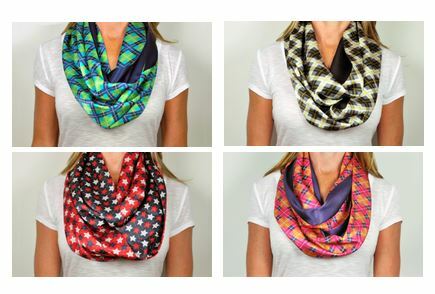 You had me at INFINITY SCARVES. Gorgeous right. And they’re silk. Heavenly. Here’s a cute outfit idea I put together with one of the scarf patterns. I have plans tonight and I SO wish I could wear this exact outfit! See all of the newly added products from Argoz on their site here. Next articleHelp Create the Ultimate Holiday Wine Shopping List – Ends in 2 Days!